Cedric Thorpe Davie was a musician, composer and academic who taught in St Andrews from 1945 until his retirement in 1978, and lived here until his death in 1983. Born and classically trained in London, he pursued his musical studies in Glasgow, Budapest and Helsinki before settling in Fife. Shortly after his arrival in St Andrews he founded the Department of Music and would eventually become Professor of Music during the 1970s. Throughout this period, stretching more than thirty years, Thorpe Davie was not only a prominent presence in local cultural and academic life, but was also working extensively on other national and international projects, whether for radio, television, theatre or, most notably, for cinema. While best known, in cinematic terms, for his scores for Rob Roy: The Highland Rogue (Harold French, 1953) and The Green Man (Robert Day, 1956, which received a BAFTA nomination), Thorpe Davie composed a total of seventeen scores between 1946 and 1960. Many of his early film works were collaborations with Scottish director David MacDonald, as the pair worked on four productions together during the late 1940s and early 1950s. 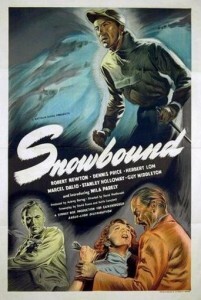 These included Snowbound (1948), their second collaboration, based on a novel by Hammond Innes and starring David Price, Stanley Holloway and Herbert Lom. Thorpe Davie began composing the score for Snowbound in 1947, the same year that he founded the University’s Department of Music. Set in a rustic cabin hidden away in the Alps, Snowbound follows Neil Blair (Price) as he assumes the role of a screenwriter with writer’s block who spies on his fellow guests, who appear to have deadly information on treasure buried during the second World War. This tale of international espionage was produced by the London-based Gainsborough Studios, which was famed for its melodramas and early support of Alfred Hitchcock. Significantly, all of the materials were sent to Thorpe Davie’s home address at 5 North Street in the heart of St Andrews, suggesting that his work on this international studio feature was done locally and during post-production. Although the film does not register in the canon of classic cinema, it did help launch the careers of some of its actors. For Dennis Price, Snowbound came just a year before the celebrated British comedy, Kind Hearts and Coronets (Robert Hamer, 1949). He would eventually go on to make Victim (Basil Dearden, 1961) with Dirk Bogarde. This project also marks a very interesting time in Thorpe Davie’s career as an academic and composer with broadening horizons. It came at a moment when he was revolutionising the University’s approach to the study of music, setting up a department and running events in St Andrews while simultaneously contributing to cinematic productions that would reach an international audience. A Descriptive List of the Cedric Thorpe Davie Collection. St Andrews University Library. Web. 21 Apr. 2014. <http://www.st-andrews.ac.uk/media/special-collections/documents/Cedric_Thorpe_Davie_list_Correspondence.pdf>. “Snowbound.” IMDb. IMDb.com, Web. 15 Apr. 2014. <http://www.imdb.com/title/tt0040808/?ref_=nm_flmg_com_15>.